Lots of organizations designate special plants of the year to highlight plants with great features and help gardeners choose plants to add to their landscape. Here are some of the choices for 2014. Paperbark Maple (Acer griseum) – This small tree grows in moist, well-drained soil in full sun to partial shade. It has an oval to oval-rounded habit and is known for its peeling, cinnamon to reddish brown bark. Trifoliate leaves are dark green, but turn red in the fall. Its seed is a two winged samara. It has no serious disease or pest problems. Paperbark maple is a slow grower (6 inches – 12 inches per year) and makes an excellent tree specimen tree for small properties. It is appropriate as an understory tree in a woodland garden or as a specimen in many locations around the home. Christmas Fern (Polystichum acrostichoides ) – This fern is best grown in organically rich, dry to medium moisture, well-drained soils in part shade to full shade. It will tolerate a dry site better than most ferns. Christmas fern is a local native that can be found on both dry and moist wooded slopes, moist banks and ravines. It typically grows in a fountain-like clump to 2′ tall and features leathery, lance-shaped, evergreen (green at Christmas time as the common name suggests) fronds. 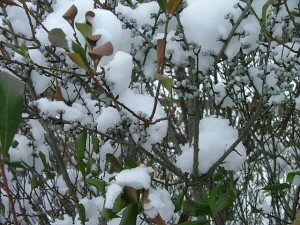 While it is considered evergreen and provides winter interest (unless the ground is covered in snow! ), the old foliage is pretty beaten down by the end of the winter and gardeners will be looking forward to young fiddleheads emerging in spring. There are no serious insect or disease problems. But, avoid planting in poorly drained soils, where crown rot can be a problem, particularly in winter. Christmas fern looks great in woodland gardens, shade gardens or shady areas of borders, wild or native plant gardens. It can be planted in shady areas along walls or foundations. Christmas fern is a good plant for massing on slopes (including dryish, rocky ones) to help combat soil erosion. Another big benefit in our area is like all ferns, Christmas fern is deer resistant. The Society of Municipal Arborists has named Persian ironwood (Parrotia persica ‘Vanessa’) as their 2014 street tree winner. Parrotia was chosen for its many merits including resistance to drought and pests, upright habit, hardiness, slow growing smaller size, fabulous fall color and interesting bark. The Perennial Plant Association also picks a plant of the year and for 2014 that plant is Northwind switchgrass (Panicum virgatum ‘Northwind’). This tall ornamental switchgrass has a distinct vertical habit. It is the sturdiest of the cultivated switchgrasses – guaranteed not to flop. Olive-green to blue-green foliage turns tan in the fall and along with its airy flower panicles provide great winter interest. By the spring, this still-bold foliage has almost a white color and looks striking when combined with an evergreen, like Eastern red cedar (Juniperus virginiana). It looks so good, it might be hard to cut back the foliage in the spring to make room the new growth. 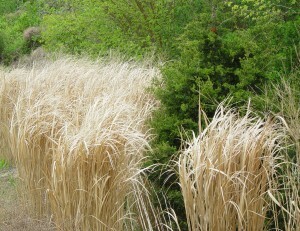 But, never fear, Northwind switchgrass will grow back quickly and provide a great backdrop for other plants in the garden. The National Garden Bureau picks a flower, vegetable and perennial each year to showcase and the 2014 choices are petunia, cucumber and Echinacea (coneflower). There are many great new coneflower cultivars available. In 2009, Mt. Cuba Center conducted an evaluation of many Echinacea species and cultivars for our region. 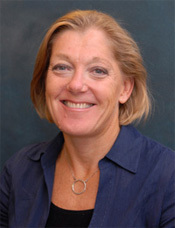 A copy of the results can be found at http://www.mtcubacenter.org/images/PDFs-and-SWFs/Mt_Cuba_Report_Coneflowers_for_Mid-Atlantic.pdf. Not be outdone, the International herb association also picks an Herb of the Year™. The selected herb must be outstanding in at least two of the major herb categories—medicinal, culinary or decorative. The 2014 Herb of the Year™ is Artemisia. This diverse herb family contains many strikingly different plants, from the highly decorative Artemisia ludoviciana ‘Silver King’ to the delicious and tender French tarragon (Artemisia dracunculus ‘Sativa’). Artemisia has a long history, prominent in folklore, its virtues used in numerous ways: to protect and heal, create tasty beverages and foods, decorate the home and work its magical properties. Finally, 2014 in the Chinese Year of the Horse. What does that mean for plant lovers? How about planting a horse chestnut in your garden? Horse chestnut (Aesculus hippocastanum) is a large tree native to the Balkans that has palmately compound leaves and very showy flowers born in upright panicles. Our native Aesculus is Aesculus parviflora (alright its common name is bottlebrush buckeye-so connecting this plant to the year of the horse is a stretch) and it is a wonderful, summer-flowering shrub that forms a large mounding colony. It is quite showy in bloom or in fall color. A recent article in Audubon Magazine written by Susan J. Tweit (January-February 2013) highlights the importance of planting native shrubs with high fat berries to support our overwintering native songbirds. Consider the black-capped chickadee, one of the most common North American wintering birds. They lose heat quickly because they have a large surface area for their size. They have to feed all day on foods rich in antioxidants and fats. Then they spend the night crammed into tiny cavities shivering and burning the day’s fuel. You can help chickadees and many other birds by planting native shrubs and trees with high fat berries. Choose native plants because birds recognize them easily and have to spend less energy foraging. Another benefit of choosing native shrubs is they will support native insects and provide food for baby birds in the spring. A study conducted at the University of Rhode Island looked at the amount of fat stored in different types of berries. They found the best berry for fat content was our native bayberry, Myrica pensylvanica, with berries that are half fat! Northern bayberry is a large, semi-evergreen shrub that can get rangy with age. It makes a great plant for the back of the shrub border of in a naturalized setting. If you want a more refined selection for a small garden, consider planting Bobbee™ bayberry (Myrica pensylanica ‘Bobzam’). This cultivar will stay compact, but still provide lots of high fat fruit for the birds. Wax myrtle (Myrica cerifera) – Smaller bayberry that grows well in the coastal plain, especially at the Delaware beaches. Southern arrowwood (Viburnum dentatum) – Prefers sun to partial shade, moist, acidic soil; foliage rich burgundy in fall; important for native bees and butterflies as well as birds. Common hackberry (Celtis occidentalis) – Drought-tolerant, craggy tree with knobby bark; fruits eaten by many bird species; attracts butterflies and moths. Staghorn sumac (Rhus typhina) –Large rangy shrub for big natural areas, leaves turn brilliant scarlet and orange in the fall and berries are high in vitamin C.
Smooth sumac (Rhus copallina) – A little smaller shrub with great red fall color with berries high in vitamin C.
Aromatic sumac (Rhus aromatica) – This sumac is lower growing and has a cultivar, ‘Gro Low’ that makes a great groundcover. Winterberry holly (Ilex verticillata) – Many cultivars of this popular deciduous holly have large, red fruit (or orange) that can last well into the winter. Depending where you live and the bird populations present, you may find these shrubs are stripped of their fruit well before they would help our overwintering birds. In that case, you are helping the fall migrators. But, the more people who plant native shrubs, the more food we’ll be providing and that can’t do anything but help those birds we love to watch!